Gigabyte Technology is one of a few Taiwan-based companies that has continued to build success in the desktop PC motherboard segment, in particular the so-called DIY market which is characterized by consumers who are dedicated to knowing what they want, and will research every aspect of a product to find the one that exactly meets their needs. 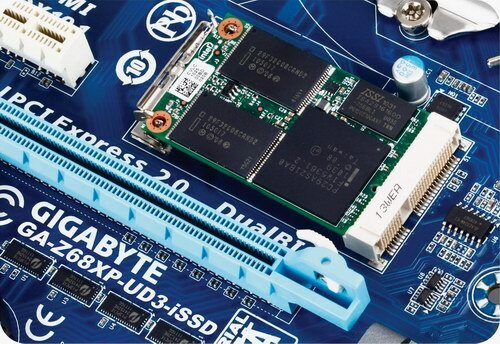 While its peers have been distracted chasing "the next big thing" – most recently netbooks, and perhaps in the future tablet PCs – Gigabyte has focused its efforts on servicing the DIY market, adding features to its motherboards to improve quality, performance, and power-efficiency. As a result the company has continued to maintain its performance in terms of shipments over the past few years, while many of its competitors saw declines. Gigabyte shipped over 18 million motherboards in 2010, of which, more than 16 million were for own-brand sale. Revenues for the year were NT$49.25 billion (US$1.7 billion) up over 12% from the year before. Digitimes recently took the opportunity to sit down with Vincent Liu, associate VP of sales and marketing to discuss Gigabyte's plans for Computex Taipei 2011 and his outlook for the motherboard market. Q: What is going to be Gigabyte's main announcement at Computex this year? A: Most important for us will be our new range of motherboards based on Intel's most recent Z68 chipset, and supporting switchable graphics, our own DualBIOS technology, and Intel Smart Response. As a subset of this lineup we will have our most exciting products, which are models that have an mSATA port integrated into their design. We believe these models in particular are optimized to take advantage of Intel Smart Response technology, offering SSD-class performance to the mainstream market. Gigabyte will be the first motherboard maker to offer this feature. Q: Can you give us more detail of Smart Response, how does it work, and what are the benefits? A: Smart Response is a new technology developed by Intel to solve the current issue that the NAND Flash chips used in SSDs are still too expensive for the mainstream market. Consumers want the performance benefits of having an SSD in their PCs in place of a traditional HDD, such as faster boot times and quicker program launching; but even a modestly sized SSD, say 80-120GB, costs a couple of hundred US dollars, and prices increase rapidly from there, making larger capacities cost prohibitive. All that needs to be compared to traditional HDDs which are currently around US$50 for a 1TB drive. Smart Response pairs a HDD which offers low cost and large capacity, but has slower access times, with a low-capacity, and so reasonably-priced SSD. You can think of it as hybrid storage, where the majority of data are stored on the HDD, and the SSD acts as a cache on which copies of your most frequently used files are kept for faster access. Smart Response manages all this in the background so you never have to worry about which files are stored on which type of storage media to get the best performance. In our own testing we have seen systems put together to take advantage of Smart Response boot in to Windows around seven seconds faster than with Smart Response disabled, and record more than four-times performance increases in common benchmarks such as PC Mark Vantage. 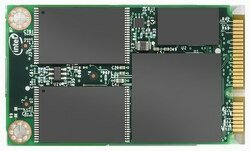 Q: So consumers will be able to buy an mSATA module instead of an SSD to use this feature? A: Exactly. The main benefit of using an mSATA module is cost. Most SSDs on the market now are intended to be used in 2.5-inch drive bays and so have additional materials and packaging, such as the larger PCB and protective outer casing, which are unnecessary and can be eliminated since the mSATA modules are designed to go in a socket on the motherboard itself. In addition, Intel has leveraged its own supply chain and will be offering mSATA modules with 20GB single-level cell (SLC) Flash specifically designed for this use. As you may know, not all NAND Flash chips are equal. You can get SLC, multi-level cell (MLC), and triple-level cell (TLC) designs. SLC chips offer faster access times and better durability than the other types, but naturally carry a high premium. Earlier when I said current market prices for an 80GB SSD are in the US$100+ range, that would mostly likely be for a drive using MLC chips. SSDs using SLC chips are currently mostly targeted at the enterprise or enthusiast markets, with pricing of around US$300 for 32GB-class models. Intel's pricing for the 20GB mSATA modules is significantly lower, and what's more, Gigabyte has partnered with Intel so that we will be offering pack-in bundles of the module along with our motherboards, for the best possible price. Q: This year did not start off too well with Intel having to recall all its 6-series chipsets due to a design flaw discovered in the SATA controller. What impact did this have on the motherboard market, and what is your outlook for the rest of the year? A: As soon as we were notified by Intel that there was an issue, we immediately opened up lines of communication with our channel partners to make sure they felt informed. I'm confident that we excelled in our handling of the issue and that has built confidence in us from our partners, and consumers. Due to the recall we naturally saw lower-than-expected shipments in the first quarter, but we are already seeing higher-than-usual orders for the second quarter to compensate. I expect that by the third quarter, any negative effects will have been canceled out, and we may even come out net-positive in the end, thanks to our better handling of the situation compared to some of our peers. In terms of performance for the year, I expect Gigabyte will see a 15% increase in our total shipments. Of that growth, around 5% will be natural as we anticipate the overall motherboard market will increase by that percentage this year. The other 5-10% will be from increased market share relative to our competitors. Q: So you don't anticipate any negative impact due to tablet PCs? A: No, and in fact quite the opposite. It's true that tablets are having an effect on the overall PC market, but this is mostly isolated to the notebook sector, and in particular netbooks. Tablet PCs can be seen as a viable replacement for a notebook in many scenarios due to their overlapping feature sets in terms of mobility and connectivity. But in the case of why and how consumers use a desktop PC, there is little to no overlap. We see tablet PCs as a companion device to desktops. Users want to have the benefits of a full-featured desktop PC at home: more CPU processing power, larger screen real-estate, multi-terabyte storage capacity, etc. which they will use to create, store and share their content. They will then utilize the improved mobility of tablets and smartphones to consume content wherever they want. Gigabyte introduced our 3x USB Power technology which allows consumers to charge devices via USB using their desktop to compliment this trend, and this year we have extended that feature to every single motherboard in our range. Another feature we are adding is 1-port, 1-fuse USB. Because USB is designed to support frequent plugging and unplugging of different devices, there needs to be a fuse separating the USB subsystem from the rest of the motherboard to protect the whole system from damage in the rare cases of excess current over the connection. In the past, it was common to have a single fuse isolating a group of ports, typically 2-4, but this meant that if the fuse did get blown, the user would lose all four ports. We have redesigned our boards so that each USB port has its own fuse. This adds to the cost, but is completely offset by the improved durability of our products. Q: Looking forward how will Gigabyte continue to differentiate yourselves from your competitors? A: As Intel and AMD integrate more and more features into their CPUs it is becoming difficult for motherboard makers to differentiate their motherboards from those of their competitors. One trend that we have noticed is that many makers are trying to make their products cheaper in order to remain profitable, but this reduces the quality of their products. We believe that our customers know good quality when they see it, so we differentiate ourselves through better quality products and also quicker time to market. We are the only motherboard maker with our own factory in Taiwan. This helps us to get our products to market quicker because we know the factory engineers well. It also helps us to improve quality control in the factory, because it is right here in Taiwan. A good example of how we are differentiating ourselves can be seen in our new Z68 series. At launch time we had stocked the channel with 11 different models, with special features like Touch BIOS and Intel spec Driver MOSFETs. Our competitors only had three models each, and we hear from our channel partners that they did not stock the channel before the launch. So we have a real advantage with the Z68 motherboards at the moment. Good to be reminded Why I choose Gigabyte time and time again.........the addition of SSD fast dual access storage of this nature as a removable modular design has many merits excluding cost ... Makes me wonder if this is the hardware to go with Marvells 88SE9130 chip were starting to read about, or is Marvell being pushed aside with Intel's own version controller chip....... who knows. I tried out this system principle with Seagate's Momentus XT series , traditional plattered storage with 4 Gb of NAND Flash incorporated, with the adaptive learning capability of these drives, I found them a treat to use in a laptop, the look and feel of SSD storage complete with fast access and boot times, is a pleasure...... but only £90 for 500Gb of storage. What I would like to know,... is Gigabyte planing on making this a stackable type modular design for an easy upgrade path or is it going to be "buy a bigger unit to get extra or faster storage"
Or..... could this be Gigabyte testing the waters for a full Modular designed Motherboard , ... allowing the owner to chop and change not just storage type and size but controller chips and extra ports of your own choosing, allowing a whole new level of system building configurable to levels we've never seen before.......Can't wait to read the next instalment. Certainly an interesting read and could lead onto many other offshoots. I wonder how much benefit would be gained from having a larger module onboard and will it be offered at purchase. This sort of technology really benefits the user that does a lot of repetative tasks though in particular. I shall definitely be watching this as it comes to launch though. I really don't know DM, but I feel speed of the iSSD will have a far bigger impact on the system then size..........One of those rare moment when speed is more important then size.........can't believe I just said that, Hang on , ... I'll use the post button to delete it. You will have to live with that one! No deleting the best ones I am sure that you are right though but assuming the same speed would a larger size be advantageous ? Yeah, but it isn't always necessary. Like CPUs having a tiny L1-L3 cache but they are able to use it very efficiently considering its size. I take it that this will learn over time what the most commonly used applications are and store them on the SSD? I am sure that you are right Badbonji and as Allan said before "size doesn't always matter"